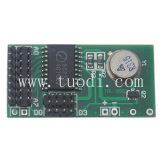 High-frequency transmitter module / 200 m band coding 2262 wireless transmitter module. 4, various household appliances, smart toys such as the remote control. If you are looking for the datasheets for these modules you will need to contact the manufacturer. Sorry. we need circuit for the module 9902,9915 for our project will u please send this to us.